Simple, discrete and versatile all describe the Apollo’s design and function. A powerful in-ground well light the Apollo uses a PAR 36 35 watt wide flood lamp to cast an ample beam spread against any landscape element. Its dual cut body allows for surface flush or angled installation options. The featured patented stainless steel gimble ring holds the lamp in place while allowing vertical and horizontal adjustments within the ABS body. Impact resistant resin housing is cut on a bias for easy installation. Patented gimble ring allows for lamp adjustability and aiming. Precision stamped brass debris grate. Housing is high temp. impact resistant ABS composite. Stainless steel patented gimble ring. Precision stamped from brass with factory rolled edge. Accepts up to one additional lens/hex cell accessory. Comes with a complete set of optical designer lenses including: clear, spread lens, frosted, hex cell. 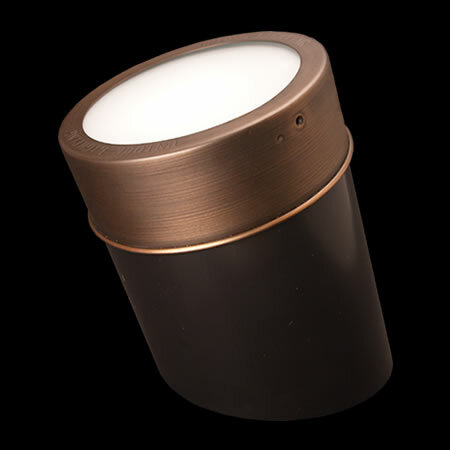 For use with a halogen lamp up to 35W PAR36 lamp. FLEX™ Series LED lamps are available in 6W and 10W PAR36 lamps. LED lamps are available in 2700K and 3000K color temperatures. A remote 12V or 24V transformer required, may be ordered separately from Unique Lighting Systems®. Voltage range for 12V halogen lamps is 10.8V to 12V. Voltage range for 24V halogen lamps is 21.6V to 24V. Voltage range for FLEX™ Series LED PAR36 lamps is 10V-15V.